Plug in a few traditional Korean spices and they'll rapidly rev up the flavour of fresh ingredients such as chicken. This dish is also great if you cut the chicken up and serve it with kimchi, more sauce and wrapped up in lettuce leaves. * Measurement was missing when recipe first published. Apologies to those affected. WHISK TOGETHER the garlic, soy sauce, vinegar and 1/4 cup of oil (the extra oil is for cooking the chicken.) Place the chicken fillets in this mix, cover with cling wrap and marinate for at least 30 minutes. MAKE THE DRY SPICE MIX by combining the remaining ingredients. DRAIN THE CHICKEN WELL. Pat the fillets dry with paper towel. Rub evenly with the dry spice mix. 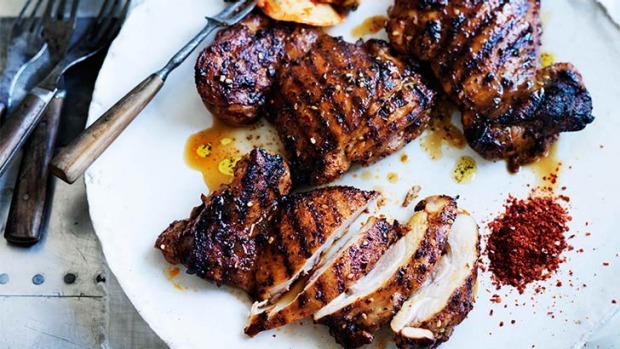 COOK THE CHICKEN on a barbecue, grill pan or frying pan over a medium heat, using the remaining oil. Cook until firm to the touch, about 4 minutes each side, depending on the thickness of the fillet. ALLOW CHICKEN TO REST before serving up with any juices from the resting plate.